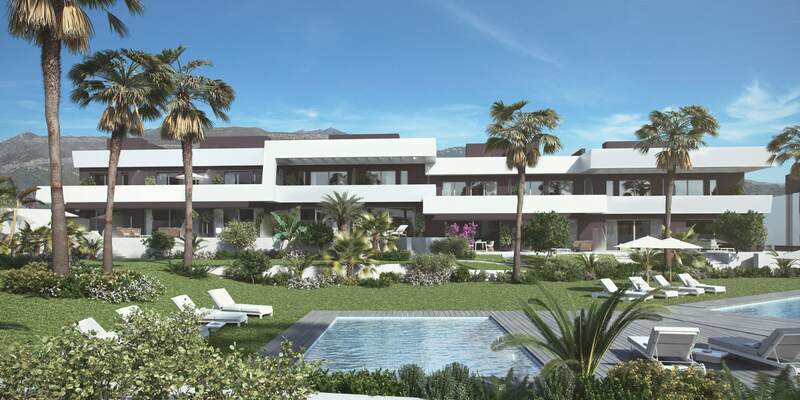 An exclusive modern project, situated in La Cala de Mijas within walking distance to the town and the beach. The development offers cutting edge design and superior quality as well as modern style, luxury and practicality in an enviable location, well connected to all of the amenities that the Costa del Sol has to offer. The properties are spacious and bright with open plan living spaces and the developer are offering purchasers the flexibility of converting the floor plan, ahead of completion, into a 2, 3 or 4 bedroom layout. These stylish luxury townhouses are laid out on 3 floors, with the addition of a rooftop solarium with private plunge pool and dual aspect to maximise views to the sea, mountains and countryside. The townhouses have been carefully positioned so each looks towards the central gardens with ample decked sunbathing area surrounding 3 stylish communal pools.